In the period from 1945 until approximately 1989, the white empire in North America learned to rely upon its cadres of military officers throughout the world to directly control its non-white (in the US a term which extends to most of the world’s population) dominions. This was defended by the pretext– inherited from the propaganda of WWII– that the Red Army which had quite surprisingly defeated Western attempts to destroy it culminating in Operation Barbarossa (a campaign that would have been impossible without the tacit consent of France, Britain and the US), would be able to drive the forces of Western empire out of its vast colonial territories or worse deprive the US of the markets it hoped to inherit from its exhausted allies. The US anti-Soviet propaganda was enormously successful– not because of anything inherent in the threat– but because then, as now, the best way to attack the declared enemy was to accuse it of all the things the US or its friends were doing. The point here is that propaganda must be based in fact, even if it is composed by deceit. This was the real lesson taught by Edward Bernays, Walter Lippmann and Edward Lansdale– not to lie outright but to control the context of interpretation. The reason the US regime could always convincingly present a “communist threat” was because it was perpetrating all those acts that terrorised people. Hence the terror was real. More importantly however, the US regime, especially the corporate media, which has always been a part of that regime, controlled and controls the means of interpretation. Hence it has always been immaterial– even absurd– for opponents of the US regime to a) defend the Soviet Union or any other enemy b) try to disprove the facts or c) show that there were some lies involved. None of these approaches can have any effect on propaganda because they all ignore the critical problem that it is not the “truth” but the “belief” (which is just about the same thing) that the regime controls. I recently spoke to some educated French artists and told them that the killings in Nice must have been in the interest of the Hollande government. (1) The fact that this peculiar disaster occurred just one day before Hollande’s emergency decrees were due to expire did not even seem suspicious to them. For both it was clear, France is a democracy and that does not happen in a democracy. In other words, the facts themselves have no bearing on the judgement of what happened in Nice. Of course I do not claim to know how this event was organized. Moreover I can easily imagine that there is no one person who knows all the facts and can document the entire sequence that led to the 80+ deaths and injuries. Two hundred years ago, it is safe to say that quite aside from mass illiteracy, access to the documentary evidence of the State’s acts– whether genuine or forged– was extremely limited. While archives were kept there was certainly very little expectation that the masses would ever have access to the official record. Since the end of the 19th century it has become increasingly common to expect people called historians or biographers to produce texts which claim to be based on the statements found in official documents or the correspondence of political and economic actors. At about the same time, Business– as the ruling class calls itself in the US– began to develop what is today called “journalism”. The founder of the first US journalism faculty (University of Missouri) was a robber baron in the print industry, Joseph Pulitzer. Together professional journalism and professional historical research began to create the foundation for modern propaganda. The theoretical basis for what has now come to be called psychological warfare was laid by the nephew of Sigmund Freud, Edward Bernays, who coined the name “public relations” to avoid the negative connotations of the German use of the Latin word “propaganda” during World War I. In fact the origins of “propaganda” are in the almost primordial centre of organised corporate violence in the West– the Roman Catholic Church. The congregation “Propaganda Fidei” was the ministry responsible for “selling the Catholic ideology”– also called “faith”. If there ever was an institution in the West with the capacity to master “context” then it is certainly the Roman Catholic Church. Propaganda was– as Lansdale practiced– never just convincing people by means of clever slogans. That is what most people seem to think advertising is. Hence one finds the fetishists of so-called “public broadcasting” snobbishly insisting that their TV sets do not condescend to advertising. Snobs like to call advertising “sponsorship”. Ironically they do not notice the frequent use of the word “sponsor” by the regime, e.g. “sponsoring terrorism”. Why does the regime not say “advertising” terrorism? Exxon-Mobil (both Standard Oil) “sponsored” Masterpiece Theater and Texaco “sponsored” the Metropolitan Opera. (2) The Pew (Sun Oil) foundations “sponsor” lots of social science research. All that fine culture and pure social science is sponsored by members of the global oil cartel that has dominated most of the world’s energy resources since the 1930s. Why is that not advertising? But I am getting side-tracked. The reason why I decided to write this explicit opinion piece is because while I write the President of Brazil (suspended) Ms Dilmar Rousseff is being removed from office by the Brazilian fascists that the US has supported since 1964– albeit not always in military uniform. (3) At the same time a massive spectacle is being held in what was once the Brazilian capital, Rio de Janiero– the 2016 Summer Olympic Games. I am old enough to remember when a typical attack on Soviet, Polish, Romanian, Hungarian, or Yugoslavian Olympic teams was that they were not “amateur” in the original spirit of the invented Olympic tradition. When the US lost in competitions against USSR or GDR athletes Americans (and presumably the subjects of their post-war dominions) were told that this was because US teams were only “amateur” and the Communist Bloc was fielding athletes who were trained and paid by the State. State athletes were not real competitors. Whereas Western amateurs were the real athletes. When the Soviet Union collapsed, not only did an ever-expanding batch of commercially lucrative “sports” join the list of Olympic disciplines but also the pretence that there was any distinction between amateur and professional athletes was abolished. Although as far as I know there has never ever been an Olympic location whose subsidised infrastructure was paid by the event itself or the supposed spin-offs, the IOC has succeeded in perpetuating the myth that an Olympic venue is a blessing instead of the curse it really is. The answer for this is quite simple. The facts do not count– it is their interpretation. When promoters (or sponsors) of the Olympics raise the five-ringed host above their heads they are practicing finance according to the Tridentine rite. The blessings (profits) are for the priests and the church, not the congregation (which also under Catholicism pays all the costs of the clergy’s sloth, gluttony and paedophilia). Yes, the Olympics are profitable. Yes, they create a variety of long-term financial opportunities. But for whom? This is transubstantiation in the highest degree– profit and opportunity to the most high (the capitalists) and purgatory (at best) for the rest. This year however propaganda fidei has reached new levels of mendacity and political effectiveness. After the election to the papacy of a Jesuit collaborator with the Argentinian military regime (actually no great surprise when the retired pope was in the Hitler Youth and began his clerical career under the most avowedly fascist pope of the last century (Pius XII)) the fairly democratic president of Argentina was replaced by a descendant of that very regime. Here the similarity to the demise of Poland after election of a Polish pope is hard to discount. A bit further to the north, the popularly elected president of Brazil has been removed from office by the same elite that deposed the Brazilian president in 1964— with the explicit (if covert) aid of everyone in New York and Washington DC that counts. 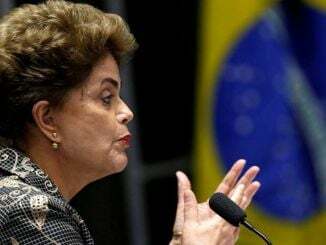 President Rousseff is being impeached as the official responsible for irregularities in the Brazilian government’s national accounts. Of course it defies common sense– no let me rephrase that– it defies informed sense to suppose that any countries national accounts are genuine and accurate. The very premise that national accounts could be held to the same (dubious) standards as those supposedly maintained by private business corporations is farcical. (4) However, a pretext is necessary because this is not 1964 and the US is not able to send a fleet to protect a military coup in Latin America– even if it wanted to do so. So imitating the script of the farcical Clinton impeachment (whereby that impeachment was more a pre-emptive strike to prevent impeachment than to actually remove a certified war criminal). So what makes this all possible: why can Rousseff most certainly be removed from office (although smart money would prefer that she just resign so that the impeachment weapon is not actually used– for fear it could backfire)? The Olympic Games in Rio of course. The Rio Games– like most sports events of any magnitude– distract most of the population, dominate media time and more importantly have provided an enormous conduit for money and other favours needed to buy whoever was not entirely willing to vote for Rousseff’s removal. Everyone know– I dare say– that the Olympic Games are a swamp of corruption, not to mention the shadows cast on the IOC in the past. So even accusations that people in the Brazilian government participated in this massive corruption are hardly surprising and most certainly accurate. Some political forensics might reveal similar manipulation in the course of the 2010 FIFA World Cup in South Africa. (1) On 14 July 2016, Bastille Day (the French national holiday), a 19 tonne cargo truck drove through the Promenade des Anglais in Nice. It had been blocked off for pedestrians. The action resulted in the death of 86 people. (2) For readers beyond US borders, Masterpiece Theater was a series produced by the Boston-based WGBH and syndicated through the PBS (US state-owned domestic broadcasting network). It was funded by corporations and featured mainly British-produced programs for and to maintain the intensely Anglophile US East Coast middle class. In fact, PBS could be considered a domestic version of Voice of America, US propaganda broadcasting aimed at foreign audiences. Texaco had agreed to sponsor Metropolitan Opera broadcasts for years in a settlement of anti-trust charges against the oil company. (3) On 31 March 1964 Joao Goulart, President of Brazil, was deposed in a military coup coordinated with the support of the US regime, especially through its military attaché and coup-master Vernon Walters. Lyndon Johnson gave assurances to the Brazilian generals that a US fleet was available to guarantee the coup’s success. The literature here is now extensive for anyone interested in US – Brazilian military relations. (4) The notion of national accounts is a fiction invented by 18th century philosophers, later called political economists. Although Business runs the State and until the 19th century the State was engaged in business monopolies, there is not only a quantitative but also a qualitative difference between what is called in German Volkswirtschaft and Betriebswirtschaft— the principles of political economy and the methods of business administration. (My appreciation to Alan Shipman of Britain’s Open University for an elucidation of this point.) One of the great deceptions of liberalism has been to confuse the two. To explain the extent of this deceptive confusion would however require far more space than any one article could supply. Karl Marx tried to explain this in three (unfinished) volumes (Capital). (5) “The Revolution will not be televised”, Gil-Scott Heron, 1969. (6) In 1986 the Brazilian military regime agreed to the return of civilian elected government. This author was a witness to part of this process at the time. (7) UN troops were deployed in the Congo and indirectly assisted the removal and murder of elected Prime Minister Patrice Lumumba. The elected president Jean-Bertrand Aristide was removed by the US regime in 2004. He was kidnapped and held captive in Central Africa. UN troops, primarily Brazilian, have been used to keep the “peace” in Haiti which has become a Clinton protectorate. (8) Planalto in Brasilia is the official residence of the Brazilian president.